Make your clients' experience smoother. Streamline your salon operations and make your clients’ salon experience even smoother with the Simple Salon Client Capture From. Instead of handing new clients a clipboard with paper on it, hand them the iPad (or whatever tablet you’re using in the salon). 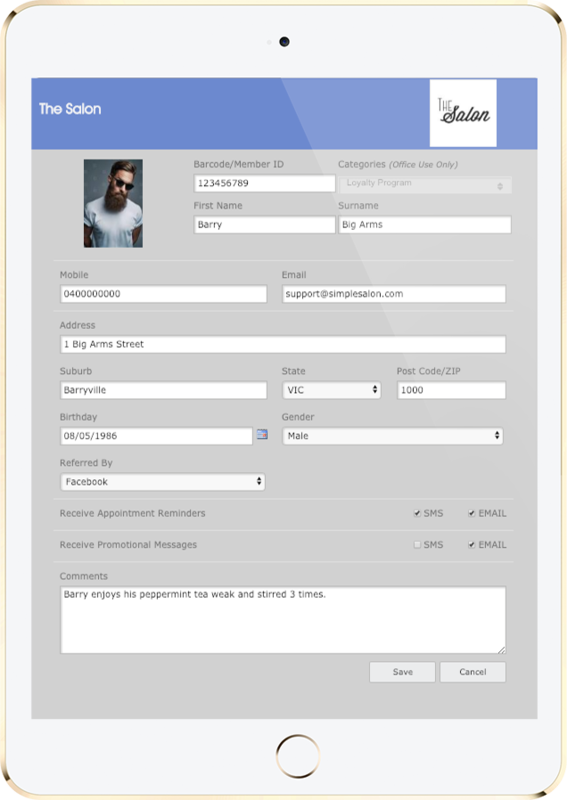 On the iPad is the Client Capture Form on which the client enters their details. As for existing clients, hand them the iPad too, because they can also use it to update their details. "The level of information that simple salon provides is fantastic and is literally replacing about 5 different checks and balances we had put in place." "The support staff were right onto my questions and really went out of her way to help me." "Customer service is extremely efficient and they always get back to you within 12 hours, if not straight away!"